A double-sized crossover event unlike any before! Two teams, seven centuries apart, united by one womans diabolical plan. 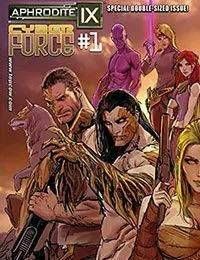 The Chairwoman from CYBER FORCE had a plan to recreate the world in her childrens image. Things didnt go as planned. Featuring the present day team of Cyber Force and the 28th century Aphrodite IX, this story lays the foundation for the new comic series IXth GENERATION, launching in 2015.